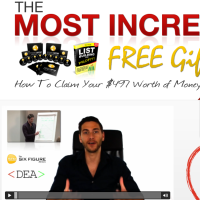 This is the 10th Lead Capture Page* that I want to show you … “Incredible Free Gift”. By now you should be getting the idea that there is lots of high quality marketing collateral available with the SFM to suit the different approaches that different people prefer. It all helps to make being part of the SFM that much easier. We are half way through now but before I finish this series there might even be a few more. This one is mostly about the free report and informational videos. People like free, they don’t value it but it’s sometimes enough to get people interested and actually have a look. Secondary to this is Stuart Ross’s story and the opportunity to change your lifestyle.